They were once powerful cruisers of the seas, but even as they sit in silence, their bold features are mirrors to their eventful past. Whether buried near to an Egyptian pyramid or a victor in one of the world’s greatest wars, the following ships are more than just vessels, they are captivating treasures that are just too unique to spend their last days sleeping with the fishes. So if you’re for an adventure into history by staring at the antique façade of a profound ship, let each of these iconic treasures take you on a cruise down memory lane. If you listen closely you may hear the faint cry of Egyptian King Cheops’ soul in the Giza Solar Boat Museum. After all, the Khufu ship concealed inside of the museum was built in the pharaoh’s honor. Although it was constructed around 2500 BC, it was discovered in 1954 buried adjacent to the Great Pyramid of Giza. As one of the world’s oldest and most fascinating pieces of antiquity, it was rebuilt under the belief that King Cheops wanted to use the 143-foot vessel in the afterlife. But as it sits silently in antiquity amongst Egypt’s greatest ancient gems, it continuously stands outs as a buried treasure shielded by the great Pyramid of Giza. The Battleship of New Jersey is renowned for being America’s most decorated ship, and it is easy to see why it is a beloved treasure. It fulfilled a legacy serving in World War II, the Gulf War as well as the Korean War, which has earned it 19 Battle and Campaign Stars. An exploration of this vessel is typically met with venturing down its narrow labyrinth of hallways that are decorated with sleeping quarters, the communication center and other remnants to the Battleship of New Jersey’s war days. Spending its days of retirement on New Jersey’s waterfront, the 45,000-ton battleship is well worth the visit. Not only is the Hurtigruten Museum a trip to the shipping company’s rich past, a visit here is topped by venturing into a 1956 "Finnmarken" boat. And once inside, its history comes to life with a sleek style that has remained intact since the cruise liner became a permanent display in 1993. From the elaborate wood furnishings to its classic staterooms, a trip around every corner is met with a surprise that lures guests deeper into its maritime history. If you’re intrigued by Hurtigruten’s exquisite voyages, you’ll especially enjoy this museum because it dynamically paints the picture of the company’s past through pictures, exhibits and by touring one of its most profound ships. When it comes to ships, no other played a role in the Battle of Trafalgar like that of the HMS Victory. In fact, the HMS Victory is such a beautiful display, there is rarely a day when it isn’t entertaining wandering visitors. Since 1765, the massive ship has been a force to be reckoned with, undergoing various transformations that have caused it to become a floating masterpiece. Its interior is bedecked with weapons as stories of her years in service unfold. 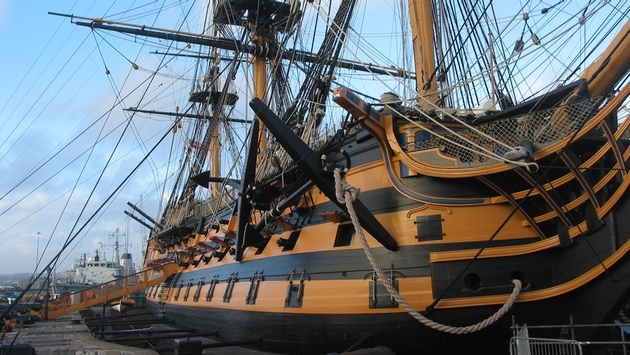 As the flagship for Vice-Admiral Nelson during Britain’s win in the Battle of Trafalgar, the HMS Victory is a triumphant warrior in its own merit.